Canine Community Heroes (CCH) is a professional dog training organization that specializes in helping people train their own dogs for future job roles (service dog, therapy dog, facility dog, and skilled companion dog). The School for Professional Canine Partners prepares working partnerships between dogs and their handlers through classes and other training options. CCH does not provide trained dogs. The training program is ideal for professionals who are interested in using their dog to help in a professional capacity, individuals with special needs to train their own companion dog or service dog, and families who wish to prepare their pet dog for an active lifestyle. CCH recognizes that dogs and their handlers need a unique training experience in order to be successful in community areas. The school welcomes both family dog and future working dog partners to progress through the program while earning certificates and titles. In lieu of the traditional obedience level classes, the program offers unique training opportunities that address a variety of skills that are useful in every day real-life and contribute to future working dog roles. 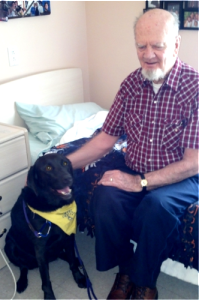 Canine partners in our program are future service dogs, therapy dogs, facility dogs, and skilled companion dogs. Their primary role is to function as a partner and be comfortable with the places and things that their people routinely do. Future working dogs will also learn specific jobs skills. Without adequate preparation, dogs and people alike can experience stress. For people, they may experience frustration with the demands of being a new working dog handler. For dogs, they may experience fear as a result of unfamiliar experiences in community areas. Over time, stress can cause a temporary or permanent disruption in the partnership. Our program engages the partnership to progress through checklists that cover a wide range of skills that promote confidence, interaction, and communication for both dog and handler. Simply using obedience commands to manage dog behavior is often times insufficient in highly distracting community areas. We focus equally on teaching handlers and dogs to respond to each other. The result is a 2-way communication method that is useful in all environments and promotes a functional partnership. Each partnership begins with a private New Student Evaluation. When it is determined that the School for Professional Canine Partners is a good fit for your training goals we will formulate a plan to get you started right away. We believe strongly that each partnership should progress at their own rate. Training modules define what skills the team needs to learn while progress is tracked on individual checklists. We offer ongoing (drop-in style) classes that address the items on the checklists. You may also choose to add in private lessons and (drop-off) Day School at any time to supplement your training program. Throughout the program your team will earn awards and titles that lead to final certification. The program is customized for partnerships according to their individual needs. We offer specialty areas of training including endorsements for work in medical settings, off-leash environments, and work with high risk populations. Our service dog training module includes laying the foundation for specific work tasks such as medical response and physical assistance training. Any individual with a disability who participates in our training programs is eligible for accommodations and adaptations to their program according to their special needs. Puppies are welcome and we encourage you to begin as soon as possible. In fact, puppies have a unique ability to learn about future job roles quicker and easier than adult dogs. Our Puppy Training Page offers more explanation about how puppies learn and our ability to compliment their natural learning abilities. My dog passed the AKC Canine Good Citizen test and several classes at another training program; can we just take the certification exam? We do not have a test only option available. Our training program is based on a different skill set than what is offered on the CGC test. Alternatively, we require a demonstration of skills using our checklist format to document the partnership skills. I already have a service dog (or therapy dog) that is registered or certified. I would like to switch to having my dog certified with Canine Community Heroes. What do we need to do? All dogs must be able to demonstrate their partnership skills on the skill checklists and pass our final evaluation in order to qualify for certification. 3. What can I do to prepare my puppy or adult dog for the School for Professional Canine Partners? We recommend that you schedule the New Student Evaluation as soon as possible. This extended private session will provide you with all the individualized information you will need to prepare and get started in the School for Professional Canine Partners. 4. I have a new puppy, how do you evaluate an 8 week old puppy? The New Student Evaluation allows the trainer to spend time getting to know your puppy’s individual personality, potential, and abilities. This information helps to formulate a plan that will put your puppy on the right track to gaining the skills needed for future success. Our young puppies who start in the program early have the highest rate of success in future working partnerships. 5. We have a child with a disability and have decided that we want to train our own service dog. Should we start with a puppy or find an adult dog? How do we get started? This is a topic that should be addressed based on your family’s individual situation. Generally speaking, we find that puppies who are raised with their special needs partner have unique opportunities to create a strong bond. It is not the right choice for all families though. Raising a puppy at the same time as caring for a child with special needs requires detailed planning including formulating a support system so the training process does not get interrupted at critical puppy developmental stages. Life happens and the best option is to plan for those times when your family needs outside support. The best way to get started is to contact us so we can help guide you into making an informed decision that is best for your family. 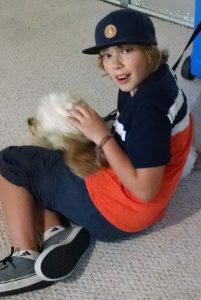 CCH also offers puppy preparation services such as puppy selection, transition, and early bonding and puppy raising support. 6. We have a family dog who we would like to take into public places. 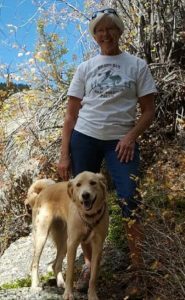 After we finish with the program and get the certification can our dog go everywhere with us? Our certification for Skilled Companion Dogs is meant to create partnerships for family activities into pet-friendly areas. You must follow all local, state, and federal laws regarding pets in public areas. Only service dogs who are accompanied by their disabled handler or trainer (in Colorado) are legally permitted into all areas of public accommodation such as stores, restaurants, businesses, and recreation areas that prohibit pet dogs. 7. Do you train service dogs for all disabilities? The short answer is No. 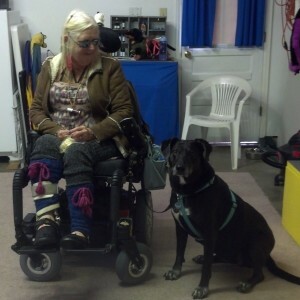 We offer training programs according to the type of work the dog will be doing and not based on disabilities. Generally speaking we offer training programs for Medical Response (including responding to physical and psychiatric symptoms) and Physical Assistance (including performing physical tasks to assist with physical and psychiatric symptoms). We do not offer service dog training for visual guiding, sound alert, allergy detection, blood sugar monitoring, pre-seizure detection, personal protection, and/or any task that may put a dog or individual at risk of injury. 8. I have PTSD and my pet dog already helps me. Will the certification allow me to take my dog everywhere? Whether your dog may accompany you in (non-pet friendly) public areas is dependent on the law. You must have a legally defined disability and your dog has to be trained to perform a job for that disability. The mere presence of the dog including dogs used for emotional support do not not qualify as a service animal under federal law. The advantage of participating in our certification program is to train your dog for a service dog task and public access skills which will identify your dog as a legally defined Service Dog. For more detailed information please see our About Service Dogs page. 9. I have a disability and would like to train my dog to be my service dog and also a therapy dog where I work. Can I train my dog to do both jobs? We recommend that you start with training only one job in the beginning. The roles of a Service Dog and Therapy Dog are very different. A service dog’s primary role is to work for you and disregard distractions including other people. A therapy dog’s role is to engage in interactions with others. For the inexperienced dog it can cause some confusion and extra training challenges if the job role is not well defined. We recommend beginning with the most important job role first and giving your dog time to become experienced in that job. Later you can return for training to add on another job role. You won’t need to repeat the entire curriculum.